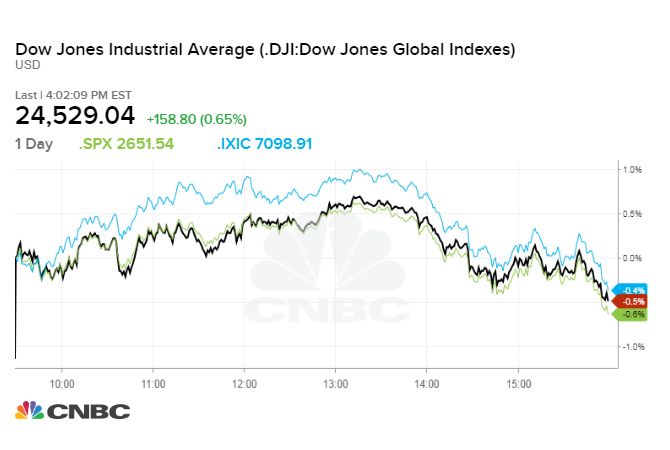 Stocks closed higher on Wednesday as investors digested news related to the ongoing trade war between the United States and China. "There's a lot of anxiety around there," said Dan Deming, managing director at KKM Financial. "The market is just dealing with some headline issues it just can't seem to shake off." "Until we get some resolution to some of those issues, I think this will continue," Deming said. Shares of Caterpillar and Boeing both rose more than 1 percent. These stocks are considered global trade bellwethers because of their exposure to markets abroad. The Wall Street Journal reported China is working to increase access to foreign companies, a move aimed at smoothing U.S.-China trade relations. This plan, the report says, would replace the country's Made in China 2025 plan, a framework aimed at making China a leader in industries like clean-energy cars and robotics. President Donald Trump told Reuters on Tuesday he would intervene in the Justice Department's case against a top executive at Chinese telecoms giant Huawei if it would help serve national security interests or help U.S.-Sino trade talks. Huawei is the one of the largest tech companies in China. It is also seen as a symbol of pride by the Chinese government. Trump also said Tuesday talks between Washington and Beijing were ongoing and confirmed he would not raise tariffs on Chinese imports until he was sure about a comprehensive trade agreement. Meanwhile, a Reuters report said Chinese state-owned companies bought at least 500,000 tons of U.S. soybeans on Wednesday. "The market has OK news today but then we're on to the Fed," said Larry Benedict, CEO of The Opportunistic Trader. The Federal Reserve is expected to hike rates next week, but its outlook into 2019 is still uncertain. Benedict also said "the market is running out of time to do anything meaningful into year-end. We're teetering around unchanged and there are only a few good trading days left." Wednesday's moves come after another volatile session on Wall Street. The Dow swung more than 500 points before closing slightly lower. The S&P 500 and Nasdaq also alternated between gains and losses throughout the session. "This intraday volatility is very headline-driven," said Mona Mahajan, U.S. investment strategist at AllianzGI. "Between trade, the Federal Reserve and recession fears, it's reason to give investors pause." "Investors are also more willing to sell rallies than buy dips. That's the sentiment right now," Mahajan said. Shares of home-improvement retailer Lowe's rose 2.9 percent after the company announced a $10 billion buyback. Lowe's also reiterated its profit outlook for fiscal 2018.